BILF1 identified as a lytic gene that downregulates surface MHC class I. 293 (A) or MJS (B) cells were transfected with different EBV genes in the bi-cistronic vector, pCDNA3-IRES-nlsGFP. At 48 hr post-transfection, surface MHC class I was stained with PE-conjugated W6/32 mAb and (in MJS only) MHC class II was stained with PE-conjugated anti-DR mAb, YE2/36-HLK. Two-colour flow cytometry was used to analyse staining in the untransfected GFP− population, shown as the solid line histogram, and in the transfected GFP+ population, shown as the dashed line histogram. The grey histogram denotes background staining obtained with an isotype control PE-conjugated antibody. The Epstein-Barr Virus G-Protein-Coupled Receptor Contributes to Immune Evasion by Targeting MHC Class I Molecules for Degradation. 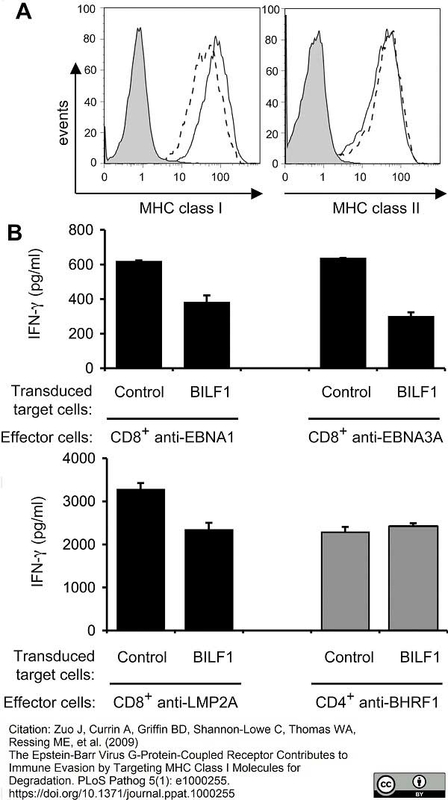 BILF1 downregulates surface MHC class I expression and inhibits the T cell recognition of endogenous EBV antigen in LCLs. (A) LCLs were transduced with PLZRS-HABILF1-IRES-GFP retrovirus. After 6 days, surface MHC class I was stained with PE-conjugated W6/32 mAb and MHC class II was stained with PE-conjugated anti-DR mAb, YE2/36-HLK. Two-colour flow cytometry was used to analyze staining in the untransduced, GFP−, population, shown as the solid line histogram, and in the transduced GFP+ (BILF1+) population, shown as the dashed line histogram. The grey histogram denotes background staining obtained with an isotype control PE-conjugated antibody. (B) LCL cultures transduced with control retrovirus or with the BILF1 retrovirus were sorted by flow cytometry to generate GFP+/BILF1− and GFP+/BILF1+ lines to use as targets in assays with EBV-specific T cells. The control and BILF1+ LCL targets were incubated with HLA-matched CD8+ effector T cells clones specific for EBNA1 (HPV), EBNA3A (YPL), or LMP2A (CLG) peptides, or a CD4+ effector T cell clone specific for a BHRF1 (PYY) peptide. After 18 hrs the supernatants were tested for the release of IFN-γ as a measure of T cell recognition. All results are expressed as IFN-γ release in pg/ml and error bars indicate standard deviation of triplicate cultures. HLA-DR positive monocytes. The percentage HLA-DR positive monocytes was decreased in all patients compared to controls (P = 0.002). The pre-operative ("black square") lowest percentage was seen in patients who developed respiratory failure (P = 0.002). Eighteen hours after intramedullary nailing ("open triangle"), a further decrease in HLA-DR positive monocytes was seen in patients with isolated femur fracture (P < 0.001) and multitrauma patients (P = 0.047). From: Hietbrink, Falco, Leo Koenderman, and Luke PH Leenen. 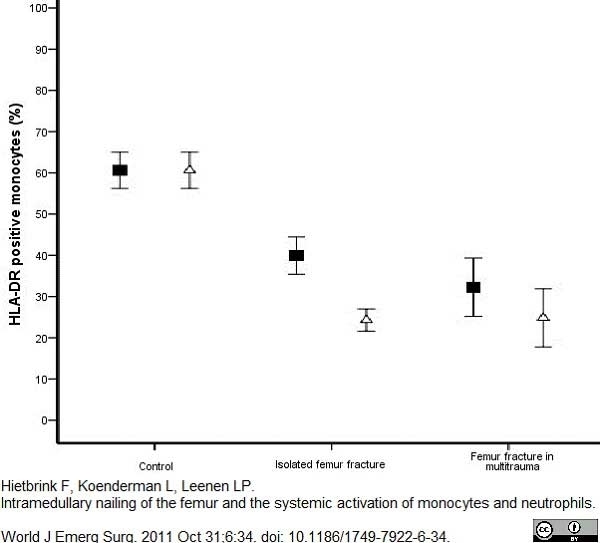 “Intramedullary Nailing of the Femur and the Systemic Activation of Monocytes and Neutrophils. World Journal of Emergency Surgery : WJES 6 (2011): 34. PMC. Web. 22 Jan. 2015. Rat anti Human HLA DR antibody, clone YE2/36-HLK recognizes a monomorphic determinant of human HLA DR which is an MHC class II cell surface receptor expressed primarily on antigen presenting cells such as B lymphocytes, monocytes, macrophages and activated T lymphocytes. Rat anti Human HLA DR antibody, clone YE2/36-HLK has also been reported to be cross reactive with mouse H-2 haplotypes b, d and q expressed by mouse strains including C57BL/6, DBA, and NZB (Brickell et al. 1981). Spleen cells from immunised AO rats were fuzed with cells of the rat Y3 Ag1.2.3 myeloma cell line. Brickell, P.M. et al. (1981) A monoclonal antibody to the HLA-DR product recognizes a polymorphic Ia determinant in mice. Bellinghausen, I.et al. (2003) Production of interleukin-13 by human dendritic cells after stimulation with protein allergens is a key factor for induction of T helper 2 cytokines and is associated with activation of signal transducer and activator of transcription-6. Thorne, A. et al. (2015) Tumor necrosis factor-α promotes survival and phenotypic maturation of poly(I:C)-treated dendritic cells but impairs their Th1 and Th17 polarizing capability. Nguyen Hoang, A.T. et al. (2012) Dendritic cell functional properties in a three-dimensional tissue model of human lung mucosa. Am J Physiol Lung Cell Mol Physiol. 302 (2): L226-37. Zuo, J. et al. 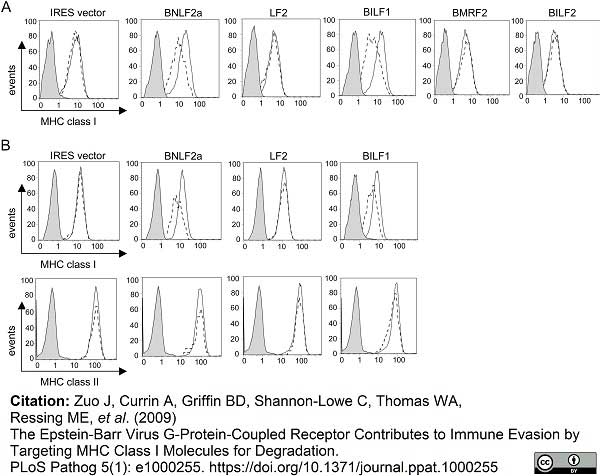 (2009) The Epstein-Barr virus G-protein-coupled receptor contributes to immune evasion by targeting MHC class I molecules for degradation. Walter, W. et al. (2001) H2-Mbeta 1 and H2-Mbeta 2 heterodimers equally promote clip removal in I-A(q) molecules from autoimmune-prone DBA/1 mice. J Biol Chem. 276: 11086-91. Cruchley, A.T. et al. (1987) Dual expression of the cell-surface antigens HLA-DR and CD1 (T6) by Langerhans cells in human buccal mucosa and skin. Arch Oral Biol. 32: 849-53. World J Emerg Surg. 6: 34. Thornhill, M.H. et al. (1989) Enhanced adhesion of autologous lymphocytes to gamma-interferon-treated human endothelial cells in vitro. Br J Exp Pathol. 70: 59-64. Jonuleit, H. et al. (2000) Induction of interleukin 10-producing, nonproliferating CD4(+) T cells with regulatory properties by repetitive stimulation with allogeneic immature human dendritic cells. J Exp Med. 192: 1213-22. Colić, M. et al. (2006) Correlation between phenotypic characteristics of mononuclear cells isolated from human periapical lesions and their in vitro production of Th1 and Th2 cytokines. Becker, D. et al. (1997) Flow-cytometric screening for the modulation of receptor-mediated endocytosis in human dendritic cells: implications for the development of an in vitro technique for predictive testing of contact sensitizers. J Immunol Methods. 203: 171-80. Klotz, B. et al. (2012) 1,25-Dihydroxyvitamin D3 Treatment Delays Cellular Aging in Human Mesenchymal Stem Cells while Maintaining Their Multipotent Capacity. Hietbrink F et al. (2015) The Impact of Intramedullary Nailing of Tibia Fractures on the Innate Immune System.